Sammy first started working at Tyree Ag in July 2013, where she worked for 15 months and then came back in February 2015. 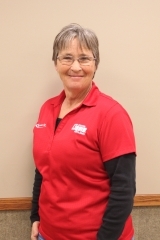 She has two children and four grandchildren and has lived in Knowles, OK for nine years. She grew up around farming wither her dad farming in both Kansas and Colorado. His love for farming inspired Sammy and she enjoys planting and seeing the effects of fertilizer and herbicides that can increase the production. Working for Tyree Ag helps Sammy to continue her passion for farming and takes pride in working with a first class team.